First of all check that the license you bought are on your account page. Step 1: download the instruction pdf and by all means: read them before you go! a. It is recommended to download the full version, where you can download the Full zip OR by clicking the ‘plus’ sign, the individual components. In the P3D instruction you will not find how to check your downloads. Read on! You will find your personal MD5 checksum on your Purchased Download page. Step 4: After downloading the zip file(s), you better first check the MD5 values. To check the MD5 Check sum of the zip files, go here. Open the program as administrator, press I agree button. After the Fastsum program is opened, press the Files button in the right upper corner. To check the MD5 value press the green start button to Run or press the F9 key. Compare your MD5 values as mentioned on your personal Purchade Download page here http://www.prepar3d.com/purchased_downloads/ with the values you retrieve with the Fastsum program. Note: The fact that your MD5 values are correct does not guarantee that the extract process that follows hereafter will be without failures. IT IS USELESS TO PROCEED WHEN THE MD5 CHECKSUM DOES NOT MATCH ! INSTALLATION WILL RESULT IN AN UNPREDICTABLE STATE. Step 6: extract the Prepar3D_v4_Academic_4.4.16.27077.zip into the folder that is created by the unzip action. Remember that you need this folder later to run the update. Step 7: Now check the MD5 values of all individual files in the folder. The file of which the MD5 is not complying with the MD5 values should be replaced. In your Prepar3D download area open the individual component list and download the related -non complying MD5- file. Do not unzip any cab file ! If you have any trouble to complete the installation, check the individual MD5 checksum values of all zips and re-download those which show discrepancy. or ELSE proceed here with the update. You may run into a situation that you cannot un-install the current client (4.3); scroll down this page and read the Known Issues. You can use the Control Panel\Programs\Programs and Features page inWindows and must confirm your actions. Say NO when asked to deactivate the validation. Open the folder and right mouse click the .exe to install as Administrator, the NET Framewordk 4.7.2 update for Windows 10. If this file is already installed, you will get a warning message that the installation is not started. Close the screen. This is the 64-bit version. Please see the History document installed for you in the FSUIPC Documents folder for details of the changes since the very first release, 5.10. IMPORTANT: 5.124 and later versions are only suitable for use with P3D version 4.1 and later! They will not work correctly with version 4.0.N.B. An up-to-date list of assignable P3D4 controls is now produced automatically, in the PDF Documents folder, each time FSUIPC5 is used with a new build of P3D. A list of changes in included in the downloaded ZIP file. Please do note the point about Mouse Macros needing re-making when you update P3D to version 4.4 or later. If you have any trouble executing as above, give me a buzz and we wil fix you remotely with a Skype or Teamviewer session. AFTER this update AND you have FTX Global BASE Pack as well as FTX Global Trees HD….you must launch FTX Central…uninstall the products and re-install them. FTX Global Range: if you did not Check all files are valid on regular base, execute Verify Files for each FTX Global Range product. no issues after getting update from here. This section only applies to those full uninstalling/reinstalling Prepar3D v4. 1. Back up any additional content or add-ons (models, scenery, configurations, etc.) before uninstalling Prepar3D. 2. To begin uninstalling the Prepar3D application, press the Windows 10 Start button and type the word “control”. This will give you the Control panel. 3. Search in the list with the word “Prepar3D” and you will see the (4) Prepar3D sections. Uninstall those 4 marked as in the picture above. 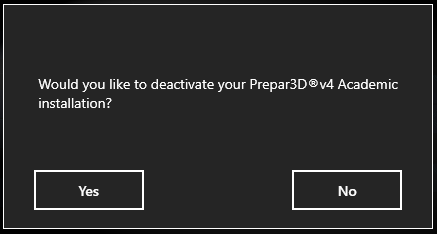 Follow the on screen prompts to uninstall Prepar3D. 4. While the uninstaller removes all files that are created by the installer, it does not completely remove content that was generated during P3D-program execution. So, it does not delete any additional folders/files that where added to the root of P3D after the initial install. REMEMBER THE INSTALLATION PATH OF P3D3 – MAKE A NOTE! 5. To completely uninstall Prepar3D, you must manually delete some P3D-folders and files that are created during runtime. Please be sure to back up any changes you have made to any of the files in the folders. 7. Now you should restart your computer. and after your computer has restarted, reinstall P3D4 in the same root (installation path) as before. 8. Follow the Installing Prepar3D v4 section as mentioned in the Prepar3D v4 Download and Installation instructions.pdf that you downloaded in step 1. What you could experience, during updating & uninstalling a previous Prepar3D v4 Academic Client, Content or Scenery that this message tells you “the account already exists”. When clicking OK or close with X, the update process stops. caused by FSLabs A320- not supported by P3D- remove product. This is a mandatory .NET Framework file for P3D44; if your Windows 10 is NOT up to date, you must run this file once. In case of a clean install of P3D44, this file is executed. In case of an update from 4.3 >4.4 you must run as above in step 14. The file ‘xyz” cannot be installed because the file cannot be found in cabinet file ‘abc.cab’. Check your files after download as in step 4 (read above). When you process a full clean install of P3D44 via setup.exe, don’t forget to run this file as Administrator.